These words (by poet Emma Lazarus) were engraved on a plaque inside the Statue of Liberty in 1903, at the height of immigration to the United States. But soon that welcoming sentiment began to change, culminating in the passage of the National Origins Act in 1924, severely limiting immigration, especially from "undesirable" areas such as Southern and Eastern Europe. 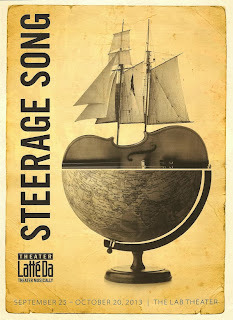 Steerage Song, a music-theater piece created by Peter Rothstein and Dan Chouinard, explores these historical themes of immigration through authentic music and text of the time. A semi-staged version of it was first presented two years ago. Much of the cast returns in this fully staged production, with slight changes to text and songs. The result is a truly beautiful expression of ideas at the very heart of America. The (perhaps not so) surprising thing is that the arguments being made against immigration today were also being made 100 years ago, making this piece not just a historical reflection but also extremely relevant to the present. 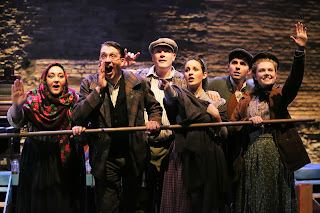 Peter (who also directs the piece) and Dan (music director) have collected dozens of songs from the American immigrant experience between 1840 and 1924, from various languages and cultures through Europe. 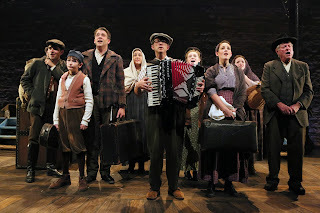 They have tied the songs together using text from newspaper articles, speeches, and other historical documents, and constructed them into eight parts representing the journey of the immigrants: The Call; Bidding Farewell; The Voyage; A Sonnet in the Harbor; Ellis Island; The Lower East Side; By the People, For the People; and The Golden Door Closes. The nine ensemble members portray the mostly nameless immigrants as they leave their homelands and find a new life in America. The one character we follow throughout this journey is perhaps the most successful immigrant musician from this period, a 5-year-old Russian Jewish immigrant named Israel Beilin who became one of America's most beloved songwriters, Irving Berlin. Through his and others' stories we witness the courage of the millions of people who left everything behind to come to America and make a better life for themselves and their families, and in doing so made America richer too. The fantastic nine-person cast includes six from the original production two years ago. 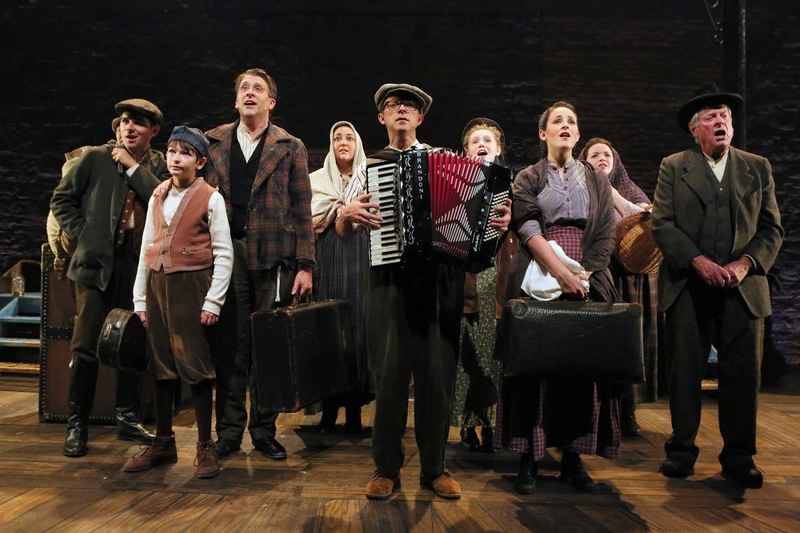 All sing beautifully in various languages or accented English (my linguist friend was impressed with the use of language and accents), as well as expressing the emotions of the characters. The ensemble includes: Sasha Andreev (always excellent), Erin Capello (with a voice like a dream), Dennis Curley (evoking tears with his sad Irish ballad), Megan Fischer (little Annie is all grown up and can hold her own among these talented professionals), Alec Fisher (another talented youngster who fits right in), Bradley Greenwald (one of my absolute favorites, any day I get to listen to him sing in German is a good day), Jennifer Grimm (with an emotional delivery of "Bring Me Your Tired, Your Poor," set to music by Irving Berlin), Jay Hornbacher (the talented veteran of the group), and Natalie Nowytski (a natural fit for this piece, she sings in over 40 languages and has studied Eastern European styles of singing). Multi-talented musician Dan Chouinard (I've seen him perform many times and he rarely uses sheet music at the piano) does a great job leading the five-piece band playing various instruments and creating the varied musical styles of the immigrants. The Lab Theater is a great open space in which to create a world of imagination, put to great use by set designer John Clark Donahue. A stage has been built to resemble a ship, with a wooden plank floor, raised balcony in the back for the band, masts, a rope ladder, and bannisters on the sides. In the second act this ship transforms into the Lower East Side, with laundry hung between the masts and carts rolling up and down the street. Long poles are used as the railing of the ship or form lines at Ellis Island; planks serve as work spaces or lecterns. On either side of the stage are great racks of clothing, with hats, shawls, coats, scarves, and various other pieces that help define and differentiate the many characters in the piece (costume design by Jeffrey Stolz). It's no secret that Theater Latte Da is my favorite theater company. Musical theater is my favorite art form, and Latte Da does it in an innovative and forward-thinking way. In fact, their tagline this year is "we don't do musical theater, we do theater musically." 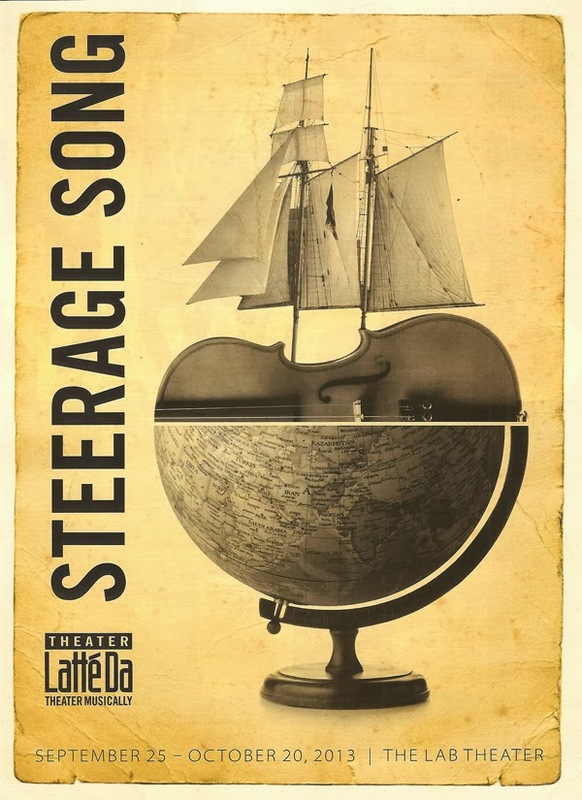 The thing that elevates Theater Latte Da above many other theaters in town is the impeccable attention to detail, on great display in Steerage Song. Every aspect of the production is of the highest quality: sets, costumes, sound design (actors are miked but in an unobtrusive way), casting, staging, the playbill, lighting, video projections, the use of props, and the talent level of the performers. Nothing is overlooked and it all adds up to a thoroughly enjoyable evening of theater. Playing now through October 20 at the Lab Theater.